If you want something stylish, eye catching, and different for your hands this chilly season, look no further! 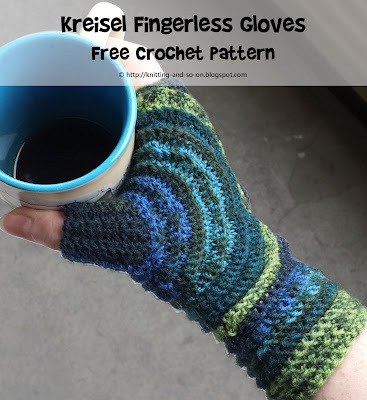 These fingerless gloves use a spiral effect during the construction which results in something amazing. This is also a wonderful project for using up those small amounts of yarn you've been stashing away. I thought that this was a Santa Hat at first glance, obviously because of the colors chosen, but if it was... what a cool Santa Hat! Let's make it a Santa Hat! 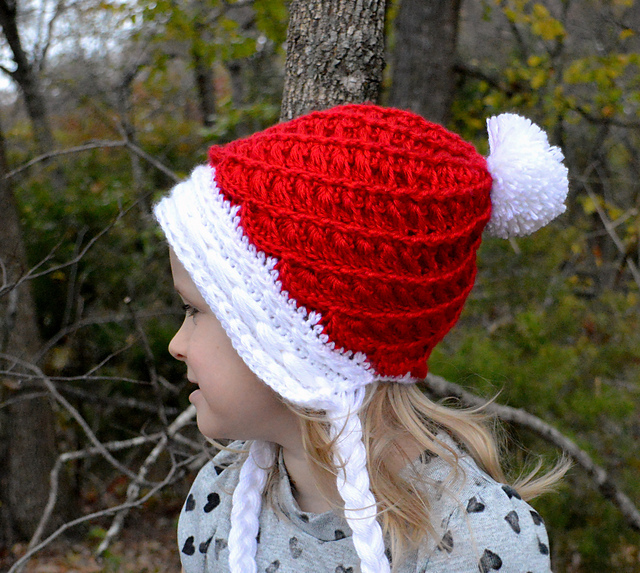 Of course this cute hat would look great in any color, but this design adds style to an otherwise normal winter hat. 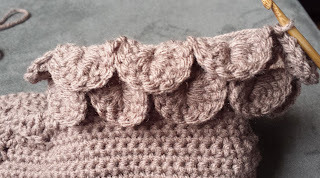 I love the texture and the pom pom too! This is a Ravelry download. 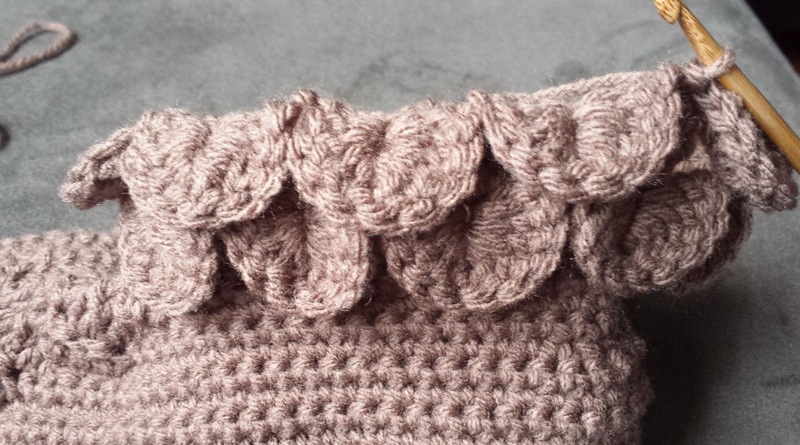 Here's a quick and easy chunky cowl! 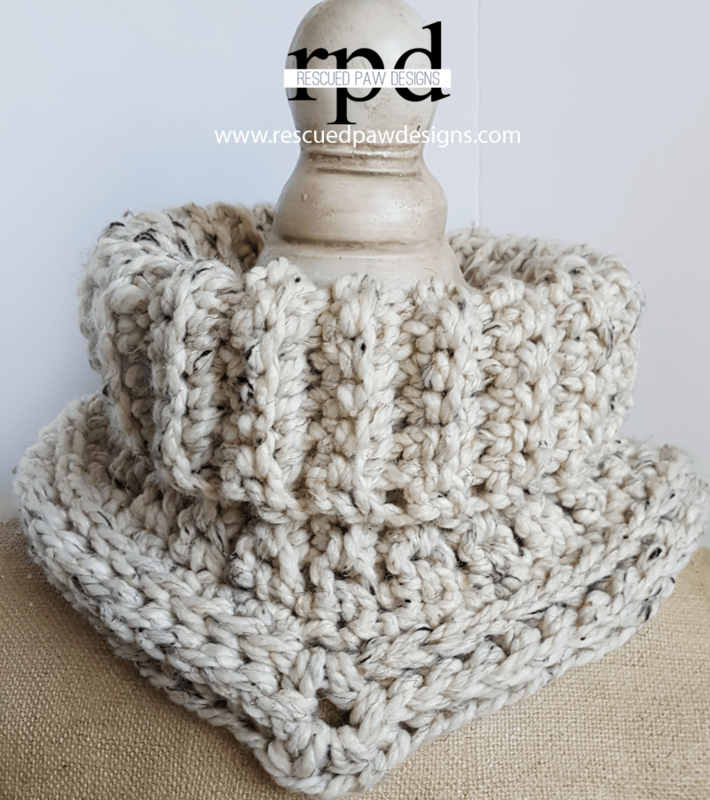 Made with chunky weight yarn and a large crochet hook, the cowl works up so fast that you'll be wearing it in the same day. The end result is beautiful and warm! 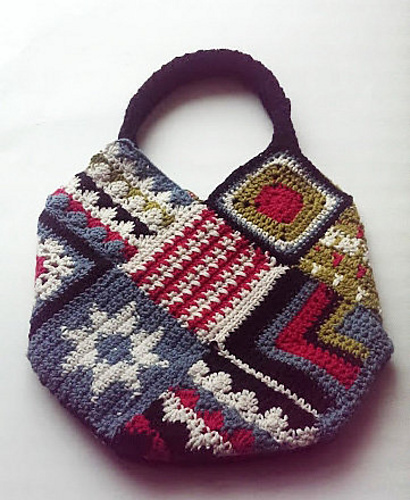 A few things about this crochet bag caught my attention! The designs in the squares are pretty cool for one, I love Nordic patterns. The squares themselves are easy to assemble with a little bit of sewing knowledge. And the colors are very well used in the design, also the colors can be interchanged to whatever you want. This looks like a great way to use up scrap yarns! The bag itself has a cozy appeal with a lot of eye interest! This is a Ravelry download. This hat looks very cozy! By using chunky weight yarn and a large hook, the pattern works up quick. The addition of large pom poms and ties complete this super comfy ear flap hat and you'll be wearing it out and about in no time. I've been on a slipper making frenzy lately, and decided that it was about time that I write this pattern out so that other people can understand it! 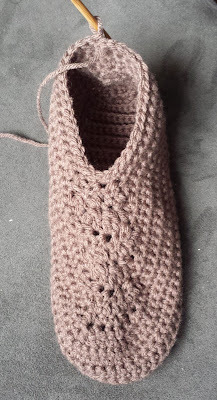 Boot slippers can be quite easy to make once you find a sole and foot pattern that you like to follow, because from there, it's all in the leg of the slipper. 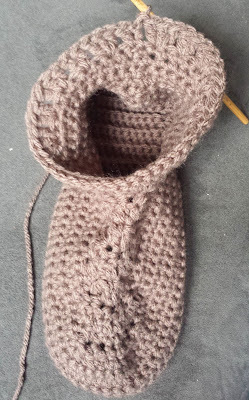 This pattern begins loosely following the pattern for Rows of Cables Boot Slippers, but changes into the crocodile stitch for the cuff. 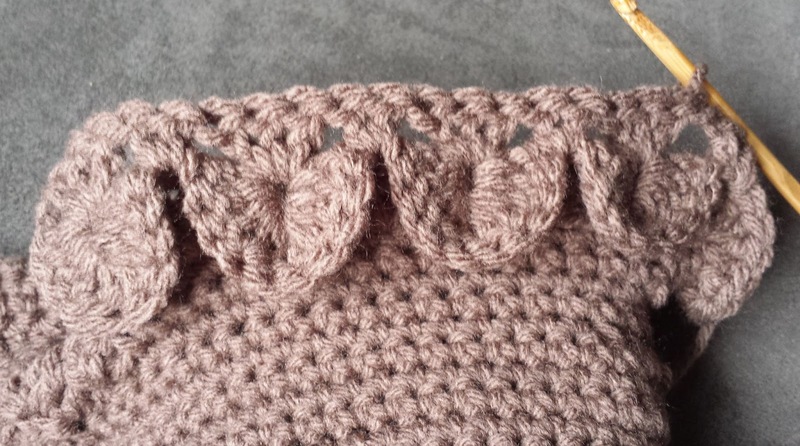 I love the crocodile stitch, and if you've never tried it, here's your chance! Many people use different variations for this stitch, it depends on what you're making, but the basic concept is always the same. I will try my best to describe it to you (with photos!). The rest of the rows are through the back loops of the sts only. Rows 20 to 31: Ch1, turn; sc in next 11 sc. 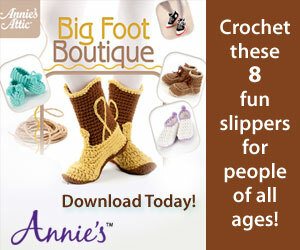 Next, you are going to crochet all around the sole of the slipper. -Ch1, turn; Slip stitch in first sc, slip stitch and ch 1 and 1 sc in next st, 1 sc in next st.
-Make 1 sc at the end of each row along side of sole (you now have 36 sc). -Place 7 sc across the back of the starting chain, ( you now have 43 sc). -Place 1 sc at the end of each row along other side of sole (you now have 77 sc). Rest of the rows are through both loops. Rnd 1: Ch3, turn; (inside facing) dc in same st as join, (skip next st, 3dc in next st, skip next st, 2dc in next st) 8 times, skip next st, 3dc in next st, sl st in top of ch3 to join. Rnd 3 (track rnd): Ch3 (counts as 1dc) turn; dc in same st as join, *3dc in center of next croc st, 2dc in next sc (between next 2 croc sts)** 8 times, 3dc in center of next croc st, sl st in top of ch3 to join. Rnd 5: Repeat Rnd 3. Rnd 7: Repeat Rnd 3. Rnd 9: Repeat Rnd 3. Rnd 10: Repeat Rnd 4. Rnd 11: Ch1, turn; sc in same st as join, (2sc in next croc st, 2sc in nest sc) 8 times, 2sc in last croc st, sc in last ch (where previously joined), sl st in 1st sc to join. Rnd 13: Ch1, do NOT turn, sc in each sc around, sl st in 1st sc to join. Fasten off. A project to make for the kids! These "Doodles" are incredibly cute hats, and include instructions for all kids sizing from newborn up to child. 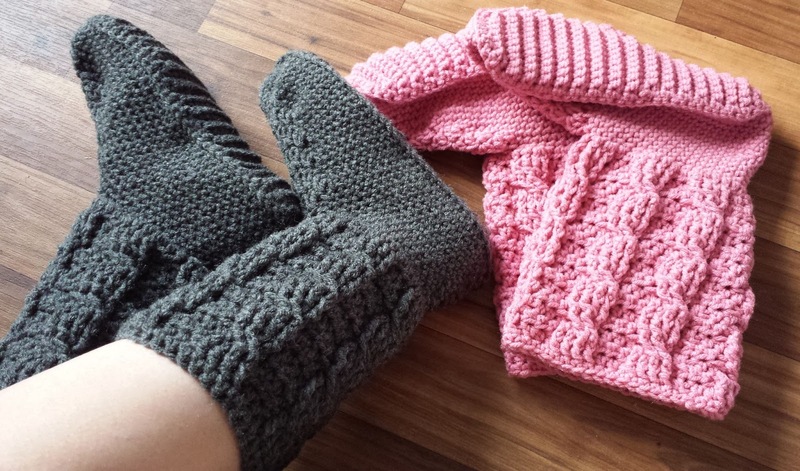 The pattern allows color versatility, which makes it a great scrap yarn project. 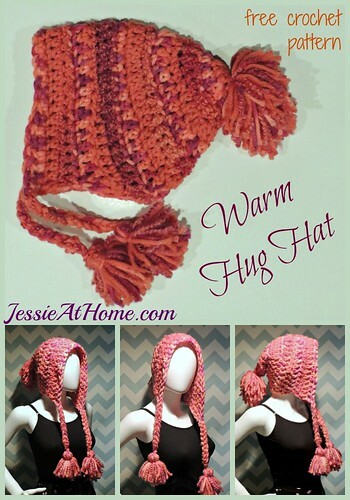 The ear flaps keep the little ones extra warm and the pretty twisted straps add extra eye appeal and a fun vibe. 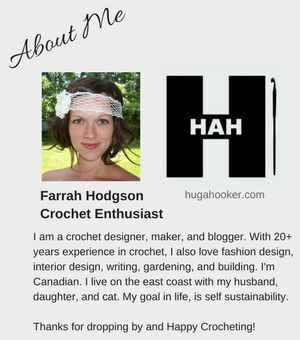 This is a Ravelry download. The texting glove takes on a new approach with the creation of SensaThread. 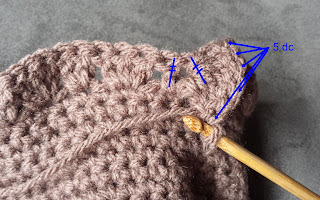 This thread can be woven right into your other yarn while crocheting the fingertips, or you can add it on after. This is great news for all of those cell phone addicts. 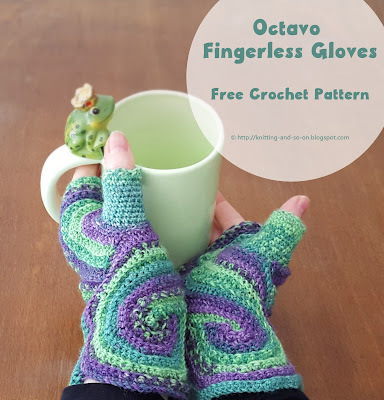 Besides the fingertips, I just simply love the look of these gloves, made with a super fine weight yarn in fun colors, where I could skip the SensaThread and be quite happy with it! Chunky hats with pompoms are making a big come back this fall and winter! I love the textured pattern of this design and the wide band of the hat. It looks cozy and warm, and the best part is that it's easy to make. 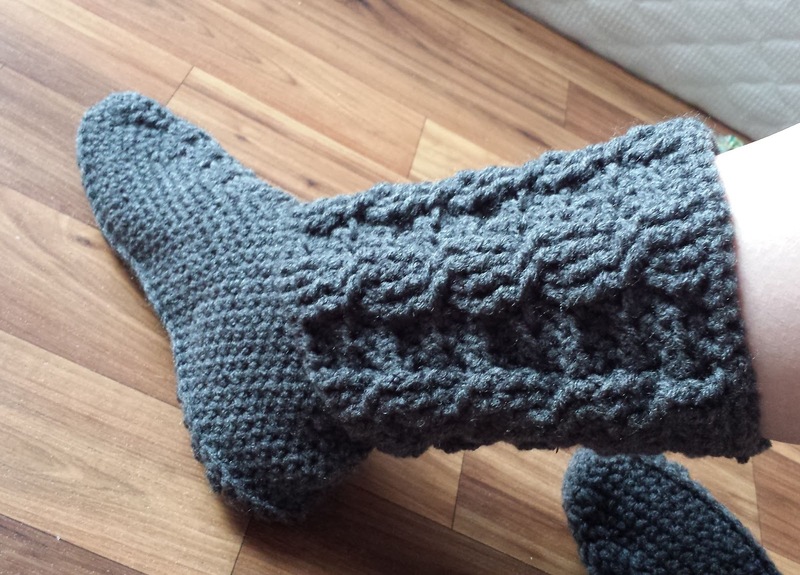 Have you made any boot cuffs yet? You should! Because they are a great accessory to decorating up your old boring boots. Make many, and have a look for every day or outfit! This pretty design uses a fauxe fur to give this nice warm and cozy look. Finish off with your favorite buttons and you have a new look for your boots. I can't take full credit for this pattern! This is a "re-make" of my mother's pattern, Cabled Boot Slippers. 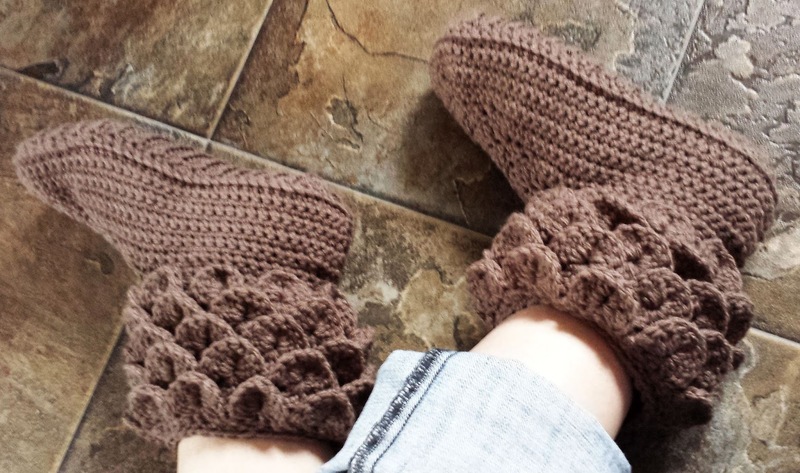 I love the look of cables, boots, and slippers; and love the original pattern, however, the yarn I was using did not match the pattern gauge so I had to change it up a bit. 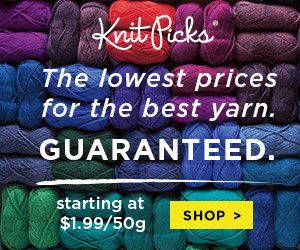 The original uses double strands of Red Heart Super Saver worsted, and I've been using Red Heart Comfort worsted. Both are worsted, but there's quite a difference! My yarn, double stranded, made the original pattern come out way too big! I tried dropping my hook size, it seemed to help for size, but it was really hard on my hands as the tension was so tight. I wasn't letting this pattern go, so I had to re-think the process! 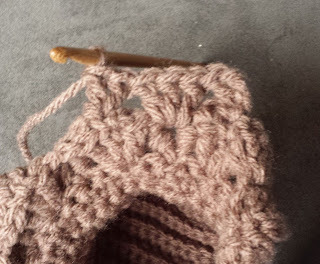 So now using one strand of worsted yarn, I was able to re-write the pattern. 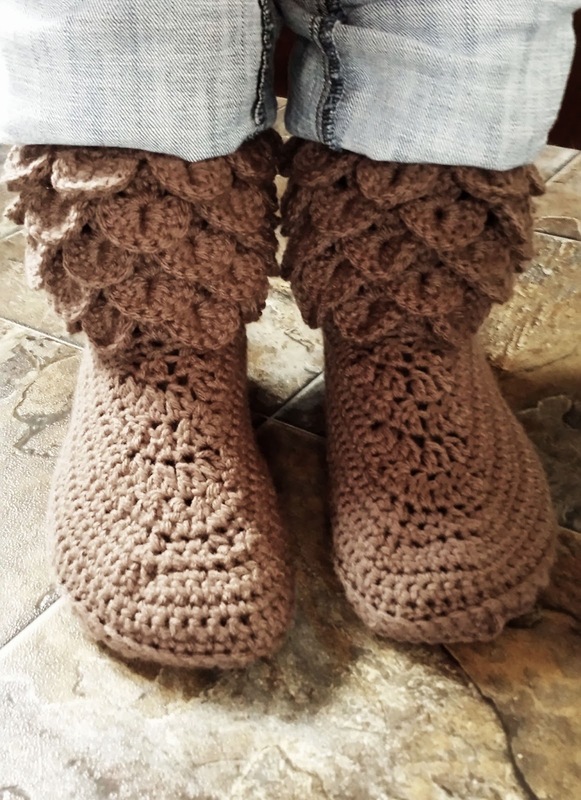 They are not as chunky as the original and have a couple extra cable rows for length. But the basic concept is the same! 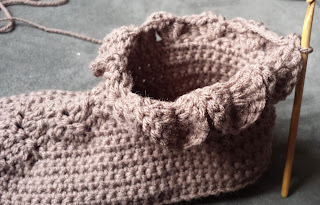 These slippers would fit a size medium/large foot, 7-9 US shoe size, as they're quite stretchy. I haven't had time to play around with other sizes yet. If you're looking for something heavier and quicker, go check out the original pattern! Red Heart Comfort, Worsted (4), approx 792m (867 yds), Multicolors: approx. 593m (649 yrds), ONE BALL WILL MAKE 3 pairs of slippers. 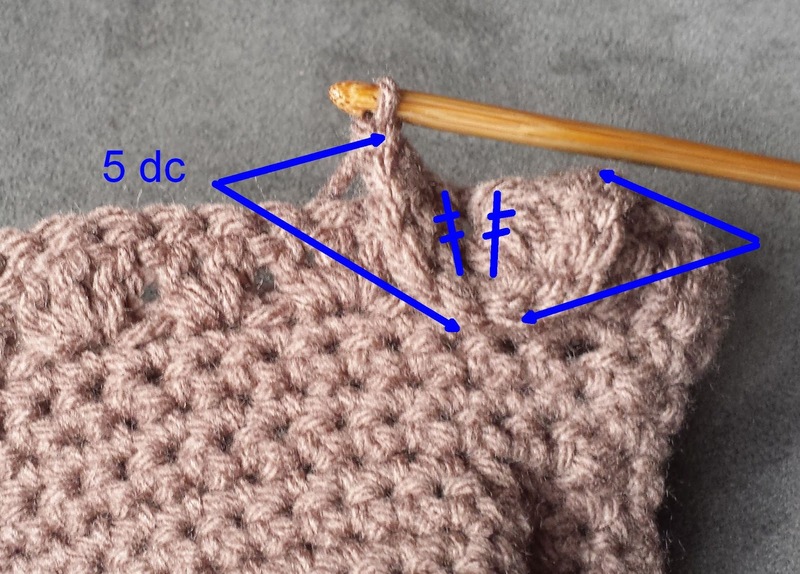 Fpdc cable twist- Skip first and 2nd post sts, fpdc around 3rd post st, fpdc around 4th post st, fpdc around first skipped post st, fpdc around 2nd skipped post st.
-Ch1, turn; Slip stitch in first sc, slip stitch and ch 1, and 1 sc in next st, 1 sc in next st. Tip: When joining each row, alternate by joining to the joining st for one row, and by joining to the first sc for the next row, etc. This keeps the back seem in a straight line. Tip: Be sure to make your first st in the first st and not in the slip stitch where you joined. Row 2: Ch1, turn; 1 hdc in first 2 sts, (fpdc in next 4 sts, 1 hdc in next 3 sts) 5 times, fpdc in next 4 sts, 1 hdc in last st, sl st to join. Row 3: Ch1, turn; 1 hdc in next st, (bpdc in next 4 sts, 1 hdc in next 3 sts) 5 times, bpdc in next 4 sts, 1 hdc in last 2 sts, sl st to join. Row 4: Ch1, turn; 1 hdc in next 2sts, fpdc Cable Twist over next 4 sts, (1 hdc in next 3 sts, fpdc Cable Twist over next 4 sts) 5 times, 1 hdc in last st, sl st to join. Row 19: 1 sc in each st, sl st to join, fasten off. 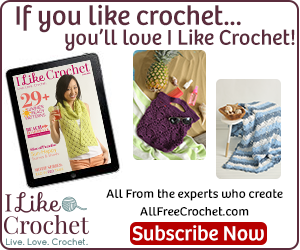 These crochet fingerless gloves are neat! I love it when I find something completely different than any other pattern of the same style, and this one is just that. The construction actually begins with the thumb! Then the circular pattern works around the thumb, and the cuff is worked at the very end. I have to try this one!